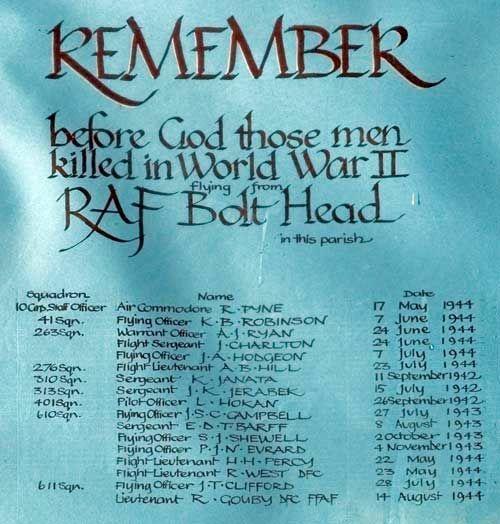 The hand-written Memorial in Malborough Parish Church commemorating men of the RAF who came from all over the world to defend our country and who gave their lives for us. Only 17 names but their exploits, and those of their comrades who lived, have become part of our history. In 1940, the harvest was gathered in from the fields on Bolt Head and two runways laid down - nothing elaborate, just coconut matting on top of the soil with metal grids on top - and this hilltop suddenly became an important strategic satellite for the RAF Squadrons stationed at Exeter Airport. To begin with, accommodation consisted of tents but as the war progressed, huts were built for personnel and hangars for planes. Bolt Head provided a useful starting point for raids on France and for protecting the English Channel approaches but it was exposed and vulnerable and official documents record at least 3 Luftwaffe attacks on this airfield. Air Commodore Reginald Pyne, of the RAF, 10 Squadron Staff Officer. Son of William and Harriet Pyne; husband of Agnes Kathleen Pyne of Ford, Chippenham, Wilts. Born in Reading in the June Quarter of 1899. Died 17 May 1944 aged 45. "This officer was the first pilot to carry out a night bombing raid over the difficult country of Waziristan and in all carried out 9 night raids. He later commanded the night flying flight and showed real leadership, determination and ability in maintaining its high efficiency." Flying Officer Pilot Kenneth Basil Robinson of the RAF Volunteer Reserve, 41 Squadron. Son of Ernest and Lilian M. Robinson of County Dublin, Eire. Born in Eire in 1922. Died 7 June 1944 aged 22. Buried in Buckland Monachorum. Warrant officer Class 2 (Pilot) Alton James Ryan of the Royal Canadian Air Force, attached to 263 (RAF) Squadron. Son of Arthur and Mabel Ryan of Calgary, Born in Calgary, Canada 20 August 1920. Died 24 June 1944 aged 23. Buried at Dinard, France. He was shot down by flak in Typhoon MN524 during an attack on St. Malo Harbour, France. Alton Ryan held the 1939-45 Star, the Atlantic Star; the War Medal, the Canadian Volunteer Service Medal and Clasp. Operational Wings were awarded to him posthumously 28 May 1947. Flight Sergeant (Pilot) John Charlton of the RAF Volunteer Reserve, 263 (RAF) Squadron. Son of William and Mary Charlton (née Redpath) of Sunderland; husband of Hilda Margaret Charlton, also of Sunderland. Born in Sunderland in the March Quarter of 1922. Died 24 June 1944 aged 22. Buried in Dinard, France. Like Alton Ryan, he was shot down by flak in his Typhoon during an attack on St. Malo Harbour, France. Flying officer John Alfred Hodgson of the RAF Volunteer Reserve, 263 Squadron. Son of Fred and Amy Hodgson of Rippon, Yorks. Born in Yorkshire in 1919. Died 7 July 1944 aged 25. Commemorated on the Runnymede Memorial. Flight Lieutenant (Pilot) Allen Barrett Hill of the RAF Volunteer Reserve, 276 Squadron. Son of George and Mary Hill (née Cartwright) of Stourbridge, Worcs; husband of Winifred Jessie Hill of Stourbridge. Born in Stourbridge in the September Quarter of 1920. Died 23 July 1944 aged 23. Buried in Stourbridge Cemetery. Sergeant Karel Janata of the RAF Volunteer Reserve, 310 (Czech) Fighter Squadron. Details of parents and age not known. Killed in action 11 September 1942 while piloting Spitfire VB EP453 NN-C. Commemorated on the Runnymede Memorial. 310 (Czech) Squadron was formed at Duxford 10 July 1940 - the official starting date of the Battle of Britain - and was entirely composed of Czech Air Force crews who had escaped from France via Poland. 86 of the pilots went into action immediately and through their skill and daring, played a significant role in that Battle. In May 1942, Exeter Airport became the Squadron's base station with a detachment being sent to Bolt Head to work alongside Coastal Command. Sergeant Pilot Jan Jerabek of the RAF Volunteeer Reserve, 313 (Czech) Fighter Squadron. Details of parents not known. Born 8 October 1919. Killed in action 15 July 1942 aged 22 after a forced landing in the Channel at 7.42 pm about 75 km south of Bolt Head. His aeroplane - Spitfire VB AD372 RY was hit by the defensive firing of a rear gunner in a pursued bomber Ju 88. His body drifted up on a French beach 12th August 1942 and he is buried in the cemetery at Saint Brieuc. No 313 Squadron was formed at Catterick 10 May 1941 as the third Czech fighter squadron, equipped with Spitfires. A detachment of this Squadron arrived at Bolt Head on 10 June 1942 and remained there for about a year. Flying Officer Pilot Junious Lyman Edward Hokan of the Royal Canadian Air Force, on attachment to RAF 401 (RCAF) Squadron. Son of Kauri and Ella Grace Hokan of St. Catherines, Ontario, Canada. Born in Ontario in 1922. Died 26 September 1942 aged 20. Commemorated on the Runnymede Memorial. 401 (RCAF) Squadron was based at Middle Wallop from 21 June 1940 and played a key role in the Battle of Britain. It was deployed from various Devon airfields in the struggle to defend the Western Approaches. Flying Officer Pilot James Smith Crichton Cambell ("Jock") of the RAF Volunteer Reserve, 610 Squadron. Son of Andrew and Helen Campbell; husband of Zoe Campbell of North Ferriby, Yorkshire. Born in 1919. Killed in action 29 July 1943 aged 24. Buried in the Bayeaux Cemetery. During the early years of the war, the RAF flew "Rhubarb"* operations daily as a ploy to distract the Luftwaffe from more important operations by forcing them to get their planes off the ground and take part in one-to-one combat. The British used Spitfires for these missions but in 1942 the Germans produced a superior plane - the Focke-Wulf FW190 A-3 - so far ahead of our technology that in April that year, we lost no fewer than 113 planes in a single month! Somehow, we retained belief in the tactic and on 29 July 1943, Jock Campbell was killed leading a section on yet another Rhubarb mission. He was shot down and killed at Vieux-Marche, some 13 kilometres south of Lannion. Sergeant Pilot Edward Dennis Tootal Barff of the RAF Volunteer Reserve, 610 (RAF) Squadron. Son of the Reverend Herbert Henry Barff and his wife Annie Isabel Barff (née Sowler). Born in Hexham, Northumberland in the September Quarter of 1918. Died 8 August 1943 aged 24. Buried in Ovingham Burial Ground, Northumberland. 610 Squadron was stationed at Bolt Head 26th June 1943 to 19 Dec 1943 then 16th May 1944 to 24th May 1944. When Edward Barff was killed, the function of 610 Squadron was to patrol convoys in the Channel and carry out air/sea rescues. Flying officer Pilot Stanley Joseph Shewell of the Royal Canadian Air Force, 610 (RAF) Squadron. Son of Thomas and Margaret Shewell; husband of Mabel Shewell of Owen Sound, Ontario, Canada. Born in 1920. Died 2 October 1943 aged 23. Buried in Haycombe Cemetery, Bath, England. 610 Squadron was stationed at Bolt Head 26th June 1943 to 19 Dec 1943 then 16th May 1944 to 24th May 1944. Flying Officer Paul Jules Noel Evrard of the RAF Volunteer Reserve. Son of M. et Mme. N. Evrard of Liege, Belgium. Born 9 September 1920 in Liege. Died 4 November 1943 aged 23. He held several awards and was a Chevalier de l'Ordre de Leopold II. "4 Nov 43: Today the squadron suffered a tragic blow in the loss, in an ASR Patrol, of Flying Officer Paul Evrard, a Belgian pilot who had been with the Squadron for some considerable time. He was flying Spitfire BM 427 when it is thought that he was blinded by the sun on a turn and his port wingtip struck the water and he disappeared. Although our aircraft searched the spot, nothing more was seen of Flying Officer Evrard. His quiet unassuming manner made him many friends and his loss was a great blow to the Squadron". Flight Lieutenant Hugh Harold Percy of the RAF Volunteer Reserve, 264 Squadron and 610 Squadron. Son of John and Josephine Percy (née Bell) of Chwilog, Caernarvonshire. Born in Midhurst, Kent in the March Quarter of 1920. Died 22 May 1944 aged 24. Commemorated on Runnymede Memorial. Flight Lieutenant Pilot Ronald ("Ronnie") West of the RAF Volunteer Reserve, 249 and 610 Squadrons. Son of David and Jessie West (née Christie) of Lossiemouth. Born in 1918. Died 24 May 1944 during the Battle of Britain aged 25. Buried in Lossiemouth Burial Ground. "In April 1942, this officer displayed great courage and determination as leader of a section which intercepted 8 Junkers 87s escorted by fighters. In the ensuing engagement, Flying Officer West destroyed 1 and probably destroyed another of the enemy's bombers. When returning to base, he sighted a Junkers 88 and, although he had expended his ammunition, he attacked this aircraft head on and forced it to jettison its bombs. In June 1942, Flying Officer West shot down a Junkers 88; he was immediately attacked by a fighter but skilfully evading it, he flew to the assistance of one of his fellow pilots who was being attacked by another fighter. Flying officer West destroyed this attacker. Whilst returning to bas, he observed one of our pilots afloat in his dinghy whereupon he passed information as to the position. Flying officer West then flew on and made a safe landing at base. This officer has destroyed at least 7 enemy aircraft." Flying Officer Pilot John Thomas Clifford of the RAF, 611 Squadron. Son of John and Gwendoline Clifford (née Holder). Born in Winchcombe in the September Quarter of 1916. Died 28 July 1944 when his Spitfire crashed landed near Roguiny, France aged 28. Buried in Roguiny Communal Cemetery, Morbihan, France. Lieutenant Robert G. Gouby of the Free French Air Force and the RAF, 340 Squadron RAF, and 611 Squadron. Identity of parents not known. Born in Vernois-sur-Mance 29 October 1919. Died at 15.30 hours 14 August 1944 while attacking a German convoy over Vilbert. The wing-tip of his Spitfire struck a tree and the plane crashed to the ground less than a kilometre away. He was identified as British to begin with but subsequently his body was exhumed twice before he was buried as a Frenchman on 21 July 1954 at the cemetery of Bourbon-les-Bains. For his cool courage and many acts of bravery, Robert Gouby was awarded the Legion d'Honneur, the Croix de Guerre (8 mentions), the DFC, and was Mentioned in Despatches.